Six days later, nothing had been done to rectify this alleged emergency health and safety hazard. When Saturday Market patrons gathered for the market festivities, they decided to move the barricades, retake the Free Speech Plaza, and were left to exercise their rights uninterrupted by law enforcement all day long. 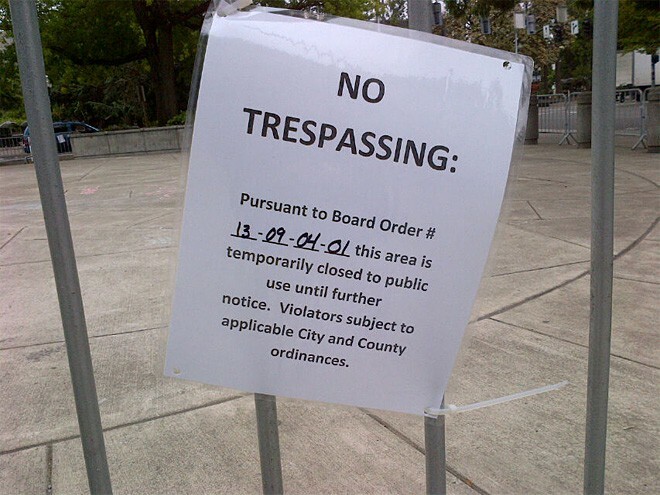 “Apparently, the health emergency dire enough to compel Lane County Commissioners to issue a complete closure of this free speech area, was not serious enough to warrant enforcement in order to protect the Saturday Market drummers, shoppers and bystanders who were sitting and standing within the ‘emergency closure’ area,” Regan said. However, as soon as SLEEPs protestors showed up to Free Speech Plaza and erected one of their symbolic tents, eight Eugene Police officers swarmed the Plaza and ordered people to leave or be arrested. Mr. Brugh made the decision to stand up for his right to assemble and protest upon this revered traditional public forum, and was arrested by EPD Lt. Natt. The brief filed by the CLDC argued that the County might have the legal right to close a traditional public forum in very narrowly tailored circumstances, but that closure must be for the shortest time period possible in order to rectify the “emergency.” Other Courts had ruled that a health and safety closure of a First Amendment forum for more than 24 hours was unconstitutional. Yes, you can close it to clean it: but you have to do so as fast as possible and then reopen the forum as expeditiously as possible. The Wayne Morse Free Speech Plaza is 70 ft. wide by 73 ft. long; it certainly does not take six days to clean a piece of cement that size. Clearly, the County was attempting to shut down the SLEEPS protests and was going to keep the Plaza closed as long as possible. In addition, the CLDC argued that the City violated the Equal Protection rights of SLEEPs protestors like Mr. Brugh when they enforced the law based upon the content of the speech or the purpose of the assembly. Mr. Brugh stood on the Plaza drumming and enjoying the day with fellow Saturday Market attendees. He called his fellow SLEEPs protestors to let them know the Plaza had been reopened. But when his fellow SLEEPs protestors arrived, all a sudden the Plaza was closed again, the police swept in to harass and arrest, and the law was applied quite differently. The Lane County Circuit Court held a hearing on July 14, 2015, in front of Judge Suzanne Chanti to hear evidence on the constitutional challenge filed by the CLDC on behalf of Mr. Brugh. After an all-day hearing, it was clear that the Court appeared inclined to grant Mr. Brugh’s Motion which would have created a written Court ruling that the County and City had violated the constitutional rights of the people of Eugene for a third time in the last two years alone. Throughout the hearing, the City’s attorney attempted to rename the Wayne Morse Free Speech Plaza as the “Terrace,” apparently in an attempt to avoid the all too obvious connotations to “free speech” in the name of the plaza. At the close of the hearing, the Court gave the City the opportunity to file a trial memo in order to attempt to respond to the brief filed on behalf of Mr. Brugh. On the day this brief was due to be filed with the Court, the City instead dismissed the case against Mr. Brugh, thus avoiding the written court opinion they knew they would lose. This is also not the first time this tactic has been used against local protestors. In two 2012-2013 federal cases, Occupy protestors were arrested while constitutionally protesting on the federal plaza (also a traditional public forum afforded the greatest 1st Amendment protections). In each case, after the U.S. Attorneys office initiated federal criminal charges against them, the CLDC would file a motion to dismiss the charges based upon constitutional grounds. In each case, when it became clear that the federal judge was going to rule in favor of the protestors, the US Attorneys office would dismiss the charges foreclosing the Court’s ability to issue a written decision on the extremely important constitutional issues being raised. This forced the CLDC to file a successful federal civil rights lawsuit against the federal government that resulted in nationwide policy changes and required the government to pay CLDC’s attorney fees and costs incurred in litigating the case. “When the First Amendment rights of individuals are taken away or diminished, we are all impacted. Erosion of our constitutional rights doesn’t necessarily happen with a big bang- often it is the slow, hidden incremental restrictions that do the most damage because most of the community doesn’t know about it or doesn’t take action to stop it.” Regan said. “Using taxpayer resources to intentionally and knowingly violate the First Amendment rights of the community, to arrest and criminally prosecute people like Mr. Brugh, to have the City and County decide who gets to exercise their rights at the Free Speech Plaza or not, and then, after years of litigation, time and effort, to dismiss the case prior to a Court ruling, is a cowardly tactic that is clearly intended to stifle protest. If the City thought it was going to win, they would have waited for the Court opinion and they would have waved it all around town. Instead, the City issued a timorous press release waxing on about City ‘priorities.’ Well, it’s been a priority for the City and County during the last two years to devote the Assistant City Attorney to the case instead of one of the regular City Prosecutors, and to subpoena multiple County employees to testify for the City in an attempt to defend the County Closure Order during vigorous litigation. It also had to be a priority for Mr. Brugh and his pro bono attorney for the last 2 years because he was being criminally prosecuted, with constitutional issues critical to a free society hanging in the balance.” Regan said. “To dismiss a case like this in order to avoid a Circuit Court Order is disrespectful to our system of justice, disrespectful to all of the people who were forced away from the Wayne Morse Free Speech Plaza under threat of arrest over the last several years, and disrespectful to me and my life.” Brugh said.